Chungwon Choue (right), president of the World Taekwondo Federation, shakes hands with Hay-keong Yang, president of Samsung Europe Headquarters, after signing a global partnership agreement at the Hotel Royal Savoy in Lausanne, Switzerland on March 10, 2005. 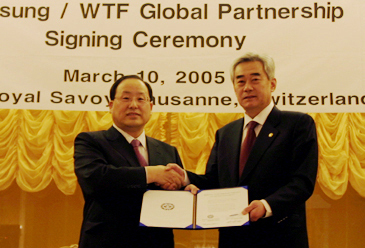 LAUSANNE, Switzerland (March 10, 2005) — The World Taekwondo Federation signed a global partnership agreement with Samsung Electronics Co. here today. Under the four-year contract, which will last through the end of 2008, Samsung Electronics, as the WTF's global partner, will secure the advertising and sponsorship rights for the WTF-promoted events, like the World Taekwondo Championships and the World Junior Taekwondo Championships, and for other WTF activities. The amount of the sponsorship fee was not disclosed in accordance with the non-disclosure clause in the agreement signed between the two parties. Among Samsung's advertising rights for its products are wireless communications equipments and devices, including mobile phones; video and audio electronic equipments; computers and memory products. This global partnership is the first of its kind in the 33-year history of the WTF, the world governing body for the sport of Taekwondo. The agreement was inked between WTF President Chungwon Choue and Hay-keong Yang, president of Samsung Europe Headquarters, during a signing ceremony at the Hotel Royal Savoy, which coincided with the WTF's extraordinary Executive Council meeting held at the IOC Headquarters. "The partnership with Samsung Electronics is sure to greatly enhance the image of taekwondo and the WTF," said WTF President Choue. "It will also help stabilize the WTF's financial status and enable the WTF to initiate new programs to propagate taekwondo. It will serve as a catalyst for the WTF to activate its marketing programs." As the global partner of the WTF, the world governing body of the sport of Taekwondo, Samsung aspires to further globalize Taekwondo and enhance the image of Samsung as the Olympic partner, as well as actively expand its sports marketing programs in international Taekwondo competitions. Samsung Electronics, the IOC's Olympic partner (TOP) in the wireless communications equipment category and strong advocate for the Olympic Movement, was the official sponsor for the WTF's world championships in the electronics sector from 1995 to 1999. For further details, please contact PR Division of the WTF (Tel: 82-2-557-5446).